From Mersing to Tioman you can go by speed ferry (max passenger 150). The speed ferry seat more people and take only marginally longer - perhaps taking 1.5 to 2 hours to the island. These cost RM35/way. When you take either kind of boat, you can ask them to drop you wherever you want on Tioman. The ferry port is just outside the center of Mersing town. Tanjung Gemok is another jumping board from where you can get on a ferry to Tioman. Tanjung Gemok is located between Endau and Rompin, about 30 minutes north of Mersing. Some travelers prefer departing to Tioman from this location, because there's none of the tide issues that plague Mersing. The downside of Tanjung Gemok, however, is that it's not as well-known as Mersing and perhaps not as accessible by taxis, nor as easy to find as Mersing. And nor as bustling, in fact. Take North-South Highway, head south towards Johor (from KL or North) . Exit at Ayer Hitam (exit 244) After toll gate (see http://jlngeoportal.jkr.gov.my/- for road map), take a right turn at the traffic junction and head towards Kluang. Before entering Kluang town, there’s a roundabout, take 3 O’clock. Follow signs to Mersing or Route 3. From here, head towards Endau. Tanjung Gemuk is about 30mins drive away from Mersing town. 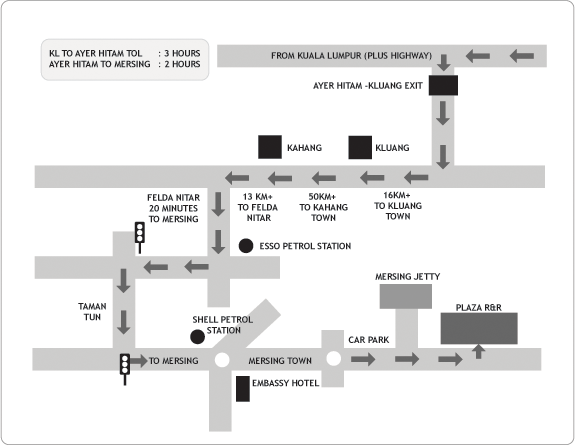 From KL, travel southwards and turn off the North-South Highway at the Senawang toll in Negri Sembilan. From here, follow the road towards Kuala Pilah then to Bahau (Have a look at http://jlngeoportal.jkr.gov.my for some visual aid). And from Bahau down to Muadzam Shah. (Have a look at http://jlngeoportal.jkr.gov.my for some help to get to Muadzam Shah). After passing through Mudzham Shah, many Tanjung Gemuk Jeti sign boards will show the way along. The route from senawang to Kuala Pilah is quite winding and may slow you down as this is a trunk road quite often used by heavily laden trucks.